CEDEX is the first ever certified blockchain based diamond exchange. The project’s goal is to transform diamonds into a publicly tradeable asset, bridging the gap between the outdated and closed off diamond industry and innovative financial markets. With cryptocurrency hype reaching fever pitch in 2017, it began to feel like there was a blockchain project for just about everything you could imagine. We’ve seen this happen before, most similarly with the dotcom bubble of the early 2000’s. Companies can just add blockchain to their name and their stock soars. A handful of web developers can write a convoluted whitepaper for a half-decent idea and raise millions of dollars through an ICO. There are some other factors that the cryptocurrency movement seems to have in common with the dotcom bubble. While the majority of coins out there today will likely go the way of Pets.com and Webvans, some few will become the Amazon’s and eBay’s – reaching far greater heights after the bubble popped. The million-dollar question, then, is which cryptocurrencies will survive. Nobody knows the answer for sure. However, it is possible to separate coins into two general categories – those that solve an actual problem and bring real value to the global economy, and those that are just taking advantage of the hype. It’s reasonable to expect that a far greater percentage of the projects that fall into the formal category will survive than those in the latter. That brings us to CEDEX, the blockchain based diamond exchange. The first question we must answer is, “How is CEDEX using blockchain technology?” From there, we can ask whether or not that utility solves real problems that couldn’t be solved without blockchain. The CEDEX project uses blockchain technology to tokenize diamonds and enable their exchange on a decentralized platform. The native token, CEDEX Coin, is a programmable digital currency which allows for the implementation of smart contracts. Those smart contracts transparently store data about the tokens’ underlying asset, diamonds, while also enabling diamond buyers and sellers to transact without a middleman. In case that sounds like just a bunch of hot air, let’s put it another way. 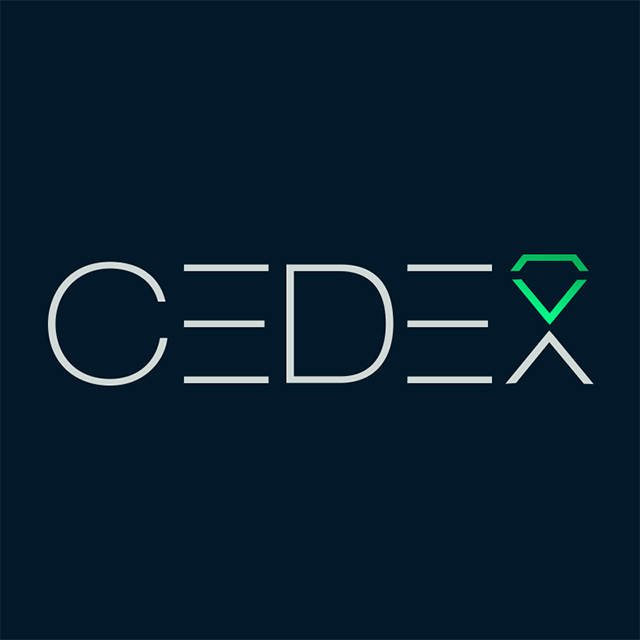 Blockchain technology enables CEDEX to create a 2-sided market on their platform that easily and safely facilitates diamond exchanges. One side, supply, targets diamond dealers and private diamond holders and gives them a new distribution channel. For industry professionals, this is an opportunity for greater convenience and profit. For private holders, it’s even more than that. A retail client looking to resell a diamond to a dealer or pawn shop usually receives a price 30-50 percent below fair market value. Such a spread between the buying and selling price is the result of a lack of transparency and liquidity in the market. On the other side, demand, entirely new participants will join the diamond market. Diamond consumers who want to get a better deal might choose to shop on CEDEX rather than from a retail store with price markups. More than that, though, investors will now be able to purchase diamonds to hedge against inflation and the stock market, much like they would with gold and other similar commodities. People have made efforts to turn diamonds into a publicly tradeable asset for decades. Up to now, all of those efforts ultimately came up short. CEDEX is the first company that both understands the issues holding diamond’s back as a commodity and has the innovative solutions to overcome those issues. Two of the big problems – lack of transparency and lack of liquidity – were mentioned earlier as the causes of the significant losses that amateur diamond holders face when trying to resell their stones. CEDEX’s blockchain technology with built in smart contracts creates far greater transparency than exists in shops or on private exchanges. At the same time, it allows for peer to peer transactions, increasing the liquidity of the market substantially in the process. Prior to the advent of blockchain, solving those problems had proven to be extremely difficult. Now, of course, is a much different story. Transparency and liquidity are about to become problems of the past, and that’s a big deal. However, there is one more problem with diamonds that we haven’t discussed yet. That is, the lack of fungibility. Unlike gold and other precious metals, diamonds have a lot of variance from one to next. You can’t know a diamond’s value simply by weighing it, or by analyzing any other individual characteristics. This leads to a complete lack of standardization in diamond pricing. As a consequence of that, amateurs can’t compete with professionals in the marketplace. Fortunately, CEDEX also has a solution for this problem. It’s called the DEX, and it’s a proprietary machine learning algorithm designed to price any certified diamond at an accuracy rate of over 99.5%. The DEX evaluates diamonds according to three main criteria – the gem composite, parallel trade composites and diamond indices composites. All of that is done with full transparency, offering investors clear recommendations for each diamond listed on the CEDEX exchange. When the CEDEX exchange launches in Q3 of 2018, it will finally be possible for general investors to confidently purchase diamonds. Cryptocurrency investors will also have the opportunity to buy tokens whose value is closely tied to asset that has been a historically stable store of value. That should help reduce the volatility of investor portfolios, which will make cryptocurrencies a less risky investment. Last but not least, diamond owners who want to resell their stones will be able to get a fair market value for them. The potential of the diamond market is enormous, and CEDEX has the keys to unlock it. That’s why – in a cryptocurrency market full of Pets.com’s and Webvans – CEDEX looks much more like an Amazon or an eBay.